Handcrafted from rose quartz, this natural crystal roller has a large and small stone for easy, effortless movements all over the face. Crystal healing has been used for centuries for smooth, youthful-looking skin. This roller may help you maintain healthy blood circulation and skin tone, and help to boost natural collagen. It can help to reduce puffiness and wrinkles; it can help improve elasticity of the skin; and it can help promote lymphatic drainage. It also helps to reduce under-eye dark circles and can eliminate toxins and tighten pores. 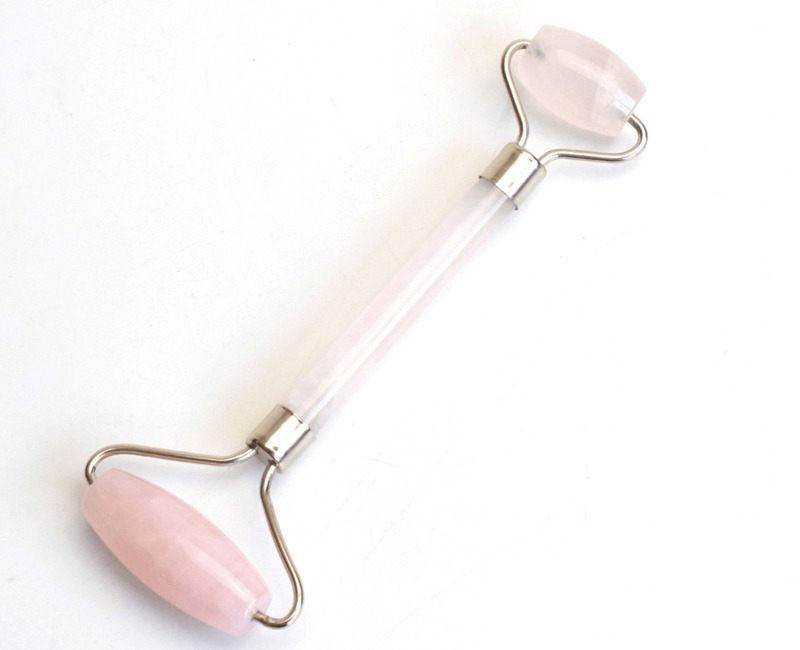 Rose Quartz Facial Roller can be used from the forehead to d̩collet̩ to build younger, firmer, stronger skin. In addition to helping relieve stress and anxiety, this hand-carved tool can help calm redness from acne or other minor skin issues, reduce the appearance of fine lines and wrinkles, reduce puffiness, and improve skin elasticity. Gua Sha is a treatment technique that involves pulling a rose quartz stone along the skin, stimulating the skin layers to reduce puffiness, promote anti-aging, flush out tissues via lymphatic drainage, and much more. Featuring an ergonomic design that adapts to the contours of the face, Gua Sha Rose Quartz Facial Massage Tool is an excellent addition to any routine to help make facial features appear more youthful and well rested. Due to natural variations in the color of the crystal, each facial roller will be unique in color and stone marbling.